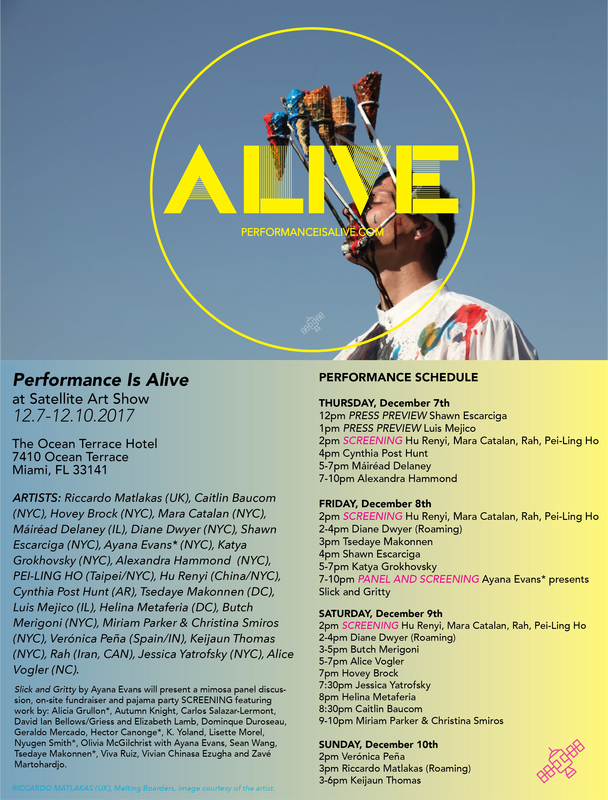 Performance Artists and actionists are invited to submit to proposals to our #AliveAtSatellite OPEN CALL. This is not a thematic open call and you are welcome to submit proposals that are live or video based performance works. Durational and short form performances are also eligible. Fire and fire related objects are (unfortunately) prohibited. Tech support is limited thus complex tech oriented performance proposals are not well suited for our fair. SATELLITE 2018 will be held next door to NADA Art Fair at the Ice Palace’s 33,000 square foot parking lot. SATELLITE 2018 will forgo a typical tent and wall structure fair and will instead be providing our own “Brick and Mortar” style fair. The entire parking lot will be outfitted with large storage containers, construction offices and all forms of drive-in vehicle options for art organizations to transform, in essence creating a mini village of free standing exhibitions. Alongside our alternative exhibits we will put together a robust large-scale public installation program. The deadline for submissions is SATURDAY, SEPTEMBER 1ST 11:59PM. Selected artists will be notified in mid-September and offered an artist honorarium. Please note, travel and housing accommodations are unavailable. Accounts from our programming last year can be found here. We look forward to your submission! Can I submit more than one proposal? You are welcome to submit a live performance and separate performance video project for consideration. Only one proposal for each will be considered. Can I create an installation for my performance? As mentioned above, Satellite will be transforming a parking lot into an art fair. Most performances will be presented outdoors in public spaces. Minimal installations will be considered. Is there a travel stipend? Not at this time. Is there an artist honorarium? Yes, selected participants will be offered a stipend and Satellite2018 Artist Package. I applied in previous years, can I apply again? Yes! Please do! I can't tell if my application submitted, the form froze. If this happens, chances are that your image file sizes are too big. Please reduce files to under 5MB. Please include details on material, duration, number of performers, concept and tech needs. Please allow time for your file to upload. SATELLITE was created in 2015 as an opportunity for young dealers, artist-run spaces and non-profits to exhibit during Miami Art Week. Since its conception, SATELLITE has grown in scale and prominence and not features art-based projects by established commercial galleries, socially engaged non-profits, and international alternative spaces. By fostering a range of programming, SATELLITE is able to offer patrons and collectors with a unique experience where art is at the forefront of creative expression, activism, and curiosity, In this way, SATELLITE is the antagonist to the standard fair and in turn, fills the voids left by Miami Art Week's soullessness through collaboration, direct engagement, and fun. SATELLITE is your chance to experience what art is without the restrictions customary to traditional settings! SATELLITE is an artist-run organization consisting of team members: Brian Andrew Whiteley, Alex Paik, Jesse Bandler Firestone and Quinn Dukes.